This is certainly a peculiar title for a blogpost!! I got the picture below from here. Lord Krishna is an avatar or manifestation of the Supreme Being as per Hinduism. 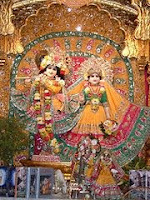 Lord Krishna is also considered as the Supreme Being by ISKCONites and other Vaishnava faiths. However, suffice to say, Lord Krishna whom Meerabai and other famous devotees worshipped with fervor is a popular God of Hinduism. Swami Vivekananda, an iconic monk who rejuvenated India and the West, talking about Lord Krishna, said 'if there is any striking characteristic about him that stands out, then it is CONSTANT WORK WITH DETACHMENT'. Swami Vivekananda makes this observation when talking about Lord Krishna in a book on Karma Yoga. Karma Yoga is a philosophy that has a lot of influence on Hindus in India. Karma Yoga means working with detachment to results. This is a powerful thought that is confusing at first glance. Karma Yoga philosophy basically means that the Karma Yogi or performer of the Karma (work) concentrates on work to such an extent that the work is done oblivious of the results. This doesn't mean that a person performs nuisance work and says that it is Karma Yoga. The choice of work (or activities) should be proper in line with proper results, however, when the work (or activity) is performed it is done with absolute focus on the activity rather than the result. This is also stated in the Bhagavad Gita (Song of the divine), which was elaborated by Lord Krishna during the Mahabharata war. The Bhagavad Gita reiterates YOUR RIGHT IS TO WORK ALONE, AND NOT TO THE FRUITS OF THY ACTION. Swami Chinmayananda, the legendary celibate monk who established the Chinmaya mission, in one of his discourses has very beautifully elaborated on this concept, which can be summarized as follows: When a person performs his activities (professional, social, personal etc) with Karma Yoga philosophy, his focus is on performance of actions, and not on the fruits or results. Hence, the concentration is much more. The work is more creative, efficient, and effective. As a consequence, the work output is truly of very high quality. Thus, the doer of activities, inevitably produces results that are in line with the expectancies or targets and the results are wholly justified. A lot of Karma Yoga philosophy is required in pharma product promotion!! To succeed in pharma marketing activity during field work, a MR has to prospect for the right set of doctors, having established a line of communication and contact, the MR has to persevere incessantly before establishing concrete sales results. It is not possible to obtain good results in form of proper Rx flow sometimes even after a year of working on the doctor!! During my field managerial days, I had a very mature and dynamic MR, Mr. P S Bhat by name at Mangalore. This senior MR would visit Dr. M, a MD DM consultant, for Rx in favour of Atelol D regularly. However, results were not forthcoming even for 12 months. It so happened during those days when the best buses between Bangalore and Mangalore happened to be the HI-TECH buses, Dr. M did not get a ticket for the overnight journey. The resourceful MR, Mr. P S Bhat, helped out, as he too was travelling from Bangalore to Mangalore. The result was, from the next day, Dr. M entered Atelol D in to his computer and there was periodical flow of Rx in favor of Atelol D (atenolol 50 mg + indapamide 2.5 mg combination). If we analyze this incident, we observe the workings of the Karma Yoga philosophy here. Mr. P S Bhat, by nature a conscentious MR, had in spite of not obtaining desired results, stuck to his schedule of regular visits to Dr. M's clinic. When this MR could provide a small help to Dr. M, mind you, Dr. M accepted the MR's help because over a period of one year, they had established a bond of trust; Dr. M picked up prescribing of Mr. P S Bhat's products. If Mr. P S Bhat has given up on this doctor after two or three visits, then Dr. M probably would not have recognized Mr. P S Bhat in the first place, and Mr. P S Bhat would not have helped out Dr. M.
The above is a small example of the workings of Karma Yoga philosophy. When applied in true spirit, Karma Yoga philosophy makes a person work with joy, application, creativity, effectiveness, and efficiency. However, there is a caveat. Let us say, a MR has worked with Karma Yoga philosophy, and instead of the company rewarding him with encouraging and handsome increments and incentives, continues with routine rewards, realising that the MR is very sincere, dumps him with more work and higher targets, then it is incumbent on the MR to lobby his case with his superiors to get a fair deal, in the spirit of Karma Yoga. Karma Yoga is not about becoming a sucker. Karma Yoga is not about accepting circumstances with a sense of defeat, detachment, and depression. KARMA YOGA IS NOT GOING ABOUT IN LIFE IN A PURPOSELESS FASHION. Karma Yoga means, the Karma Yogi is a dynamic, creative, reasonable and energetic person. The Karma Yogi MR has to put forth his case courageously, reasonably, and with the right communciation to establish win-win relationship with his company. Karma Yogis are not sheep but lions as Swami Vivekananda would probably agree. Life is full of nettles and challenges. Karma Yoga philosophy is a sobering approach to life. It helps take life on, in a constructive spirit. It acts as a bulwark against anxiety and depression, the Karma Yoga approach is positive and helps manage disappointments and challenging circumstances. It needs to be understood in the right sense. Karma Yoga is not about defeatism, it is working with focus on the various approaches and activities with high involvement. Today, pharma professional life operates in a fast and furious marketplace. Doctors are tougher nuts to crack for the MR. Give and take in relationship has a greater emphasis. Patience is required. A highly intensive NO -HOLDS BARRED result oriented activity will only bring about stress & dissapointments. One needs to work on doctors and product concepts with doggedness for a semblance of acceptable results. In fact, it will require all the Karma Yoga philosophy to produce high involvement, creativity, efficiency and effectiveness. I am on to Kolkatta, on professional work, next week, Kolkatta and West Bengal is a land that celebrates many festivals, including Lord Krishna. ISKCON has its birth in Chaitanya Mahaprabhu's philosophy who was from Navidvipa (West Bengal). It is somewhat pertinent to recall Lord Krishna this weekend!! Thanks for reading this blogpost, please do scroll down and read all other posts, and kindly recommend this blog to your acquaintances.